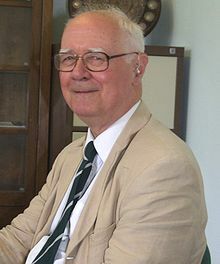 John Polkinghorne (born October 16, 1930, in Weston-super-Mare, England) is a British particle physicist and theologian. He has written extensively on matters concerning science and faith, and was awarded the Templeton Prize in 2002. Divine Action: An Interview with John Polkinghorne by Lyndon F. Harris in Cross Currents, Spring 1998, Vol. 48 Issue 1. Let me end this chapter by suggesting that religion has done something for science. The latter came to full flower in its modern form in seventeenth-century Europe. Have you ever wondered why that's so? After all the ancient Greeks were pretty clever and the Chinese achieved a sophisticated culture well before we Europeans did, yet they did not hit on science as we now understand it. Quite a lot of people have thought that the missing ingredient was provided by the Christian religion. Of course, it's impossible to prove that so - we can't rerun history without Christianity and see what happens - but there's a respectable case worth considering. It runs like this. The way Christians think about creation (and the same is true for Jews and Muslims) has four significant consequences. The first is that we expect the world to be orderly because its Creator is rational and consistent, yet God is also free to create a universe whichever way God chooses. Therefore, we can't figure it out just by thinking what the order of nature ought to be; we'll have to take a look and see. In other words, observation and experiment are indispensable. That's the bit the Greeks missed. They thought you could do it all just by cogitating. Third, because the world is God's creation, it's worthy of study. That, perhaps, was a point that the Chinese missed as they concentrated their attention on the world of humanity at the expense of the world of nature. Fourth, because the creation is not itself divine, we can prod it and investigate it without impiety. Put all these features together, and you have the intellectual setting in which science can get going. It's certainly a historical fact that most of the pioneers of modern science were religious men. They may have had their difficulties with the Church (like Galileo) or been of an orthodox cast of mind (like Newton), but religion was important for them. They used to like to say that God had written two books for our instruction, the book of scripture and the book of nature. I think we need to try to decipher both books if we're to understand what's really happening. This page was last edited on 27 December 2017, at 22:40.